Imagine, you come home from work, head out into the garden and pick your salad for supper. Or how about swinging past the neighbourhood urban farm at the weekend and pick some fruit for Sunday lunch. Farmscape, California’s largest urban farm venture, has been building these kind of options for city-slickers and companies for over 10 years, but recently interest has exploded. An agrihood is a farm experience in the middle of a city. Think an urban farm meets a suburban community centre. It’s the new definition of a mixed use development, instead of a shared tennis court, there’s an orchard and growing space. “In America, when they started building stuff, the standard was to have everybody have a ton of lawn. Everyone has a front and back lawn, despite the fact that doesn’t really work. It works in certain environments; it definitely doesn’t work in California,” explains Lara Hermanson, the Principal at Farmscape. As we want to reduce our food miles and guarantee quality of our fresh produce, agrihoods have shot up in popularity. In 2014, Farmscape worked on one such project, it now has 10 on the go. “They’re very easy to get through city councils and there’s a lot of positive feedback from neighbours about them. It looks a lot prettier and more pastoral than big walls and very, almost corporate-looking landscaping. They’re a big hit,” says Hermanson. This growing boom also coincides with a wider desire to be surrounded by more nature in our cities and a rise in a more plant based diet. An agrihood helps tick all those boxes. Farmscape don’t just manage agrihoods for forward thinking tech bros in Silicon Valley. 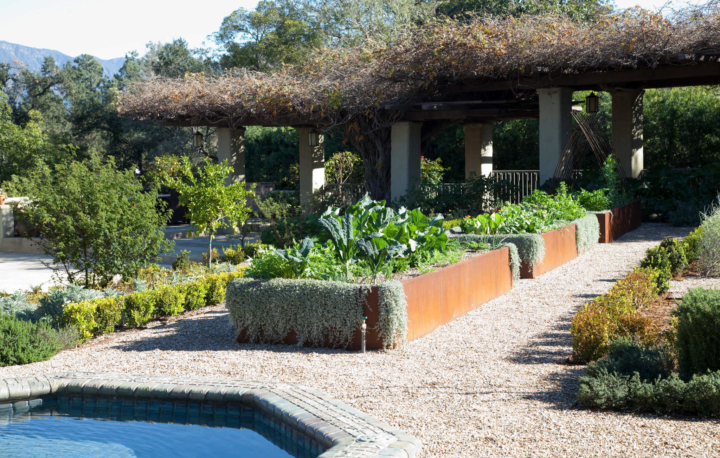 Their clients range from residential growers looking for help to create a versatile, permaculture inspired back garden or tiny veg beds on rooftop gardens, to restaurant gardens and enormous plots of commercial land – Farmscape installed and now manage an edible garden at the Levi’s Stadium in LA for instance. They advise, build and manage the spaces or help you manage it, so that everyone gets consistent, colourful, Californian food. They have over 700 projects across California, growing food for Fortune 500 companies, Michelin-starred chefs and World Series champions. Farmscape have it down to a fine art and won’t accept every new location as a potential growing space. “We say no to as many projects as we say yes to, because we know they won’t be very viable. We don’t want to give somebody a garden where they’re going to have to be constantly fighting nature. For instance, if you have a bunch of 40ft trees encircling your very small backyard, we’re not going to take your project on, because the trees are habitat for birds and wildlife, the tree roots will invade the garden and cast a lot of shade,” says Hermanson. While keen gardeners are inundated with online information about how and when to grow crops, there’s nothing like having a local expert on hand and Farmscape hold clients’ hands so they become confident in how to grow their own fruit and veg. Farmscape help clients grow salad greens, tomatoes, tiny root crops like radishes and colourful carrots – anything that will grow in small raised bed. “Everyone’s favourite is tomatoes. Tomatoes are the big year-in, year-out,” says Hermanson. The service also advises on heritage crops, which have grown in popularity over the last few years. These crops are a little more finicky about where and when they grow so they advise mixing a few heritage crops with more ‘work-horse’ crops. “Similarly, we have some regular green beans and some heirloom beans, so you get some interesting ones but you’re still going to get enough so you feel like you’ve got your money’s worth,” she says. With a huge rise in plant based eating – another California food trend that’s gone global – Farmscape’s managed plots slot in perfectly for time-poor, health-conscious, eco-aware Californians who want to know their food is local. “Our ethos is very much wrapped up in plant-based diets and that’s the principle people want to pass onto their children. This sort of backyard growing focuses on seasonal ingredients and helping plant-based diets,” she says. So time you want to explore the ‘hoods of LA or San Francisco, head down to an agri-hood and find the green soul of California.